New Repertory Theatre, in residence at the Arsenal Center for the Arts, will present the New England premiere of "Indulgences," a farcical comedy by Chris Craddock. Performances are scheduled to run January 17 - February 6 at the Arsenal Center's Charles Mosesian Theater in Watertown. Once upon a time in a kingdom somewhere, a king and a commoner swap identities, a prince and his lover plot to protect their union, two advisors conspire to foil everything, and a man known only as "Salesman" bargains for everyone's "happily ever after." In Chris Craddock's comedy, audiences learn that the solution to life's intricate puzzles may just be found in a fractured fairy tale. 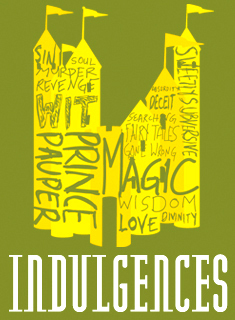 "Indulgences" features New Rep favorites, including Steven Barkhimer, Leigh Barrett , Neil A. Casey, Ben Evett, and Ed Hoopman. Making their New Rep debuts are Joel Colonder and Tony Larkin. Chris Craddock has written or co-written more than 20 plays as well as 2 feature films. He has also helped create three musicals. Highlights of his writing career include: "BASH’d a gay rap opera," which played three months Off Broadway and is the recipient of a GLAAD award; "BoyGroove," which received a six week commercial run in Toronto and a Dora Award. "3…2…1," co-written with Nathan Cuckow, which toured to the Magnetic North Festival in Ottawa 2006; "The Pharmacist/La Pharmacien," a bilingual feature film written by and co-starring Craddock, currently in audio-post; and "Summer of My Amazing Luck" (adapted from the novel of the same name by Miriam Toews), which toured extensively in Canada and is being developed into a feature film by Merit Productions in Winnipeg. His hit solo show "Moving Along" has toured across Canada and has been presented by such companies as One Yellow Rabbit and Theatre Network. It was also filmed for Bravo Television’s Singular Series. For information and tickets, call 617-923-8487 or visit www.newrep.org. Free parking is available adjacent to the theater.